KNBR & The San Francisco Giants are ready to officially kick off the 2019 baseball season at the 27th Annual KNBR Giants FanFest Presented by Zenni on Saturday, February 9th at Oracle Park! 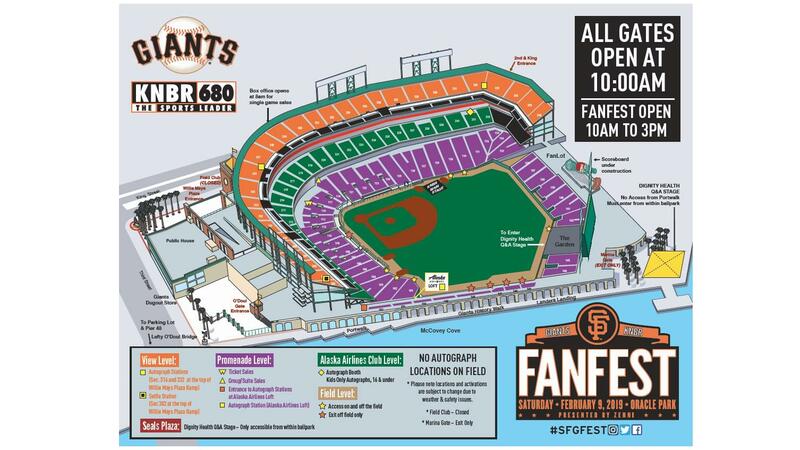 The gates for the 27th Annual KNBR Giants FanFest will open at 10:00a.m. There are a lot of exciting events planned throughout the day. Join your favorite KNBR personalities on the Main Stage along the third base side for player interviews. Have your questions answered by your favorite Giants players on the Dignity Health Q&A Stage. The Dignity Health Q&A Theater will be stationed in Seals Plaza. You will find KNBR talent conducting live interviews with players, coaches and medical staff. The theater can only be accessed from inside the ballpark; through the Garden on field level. The theater will not be accessible from outside the ballpark. Theater capacity will be closely monitored and enforced. Stop by the “Selfie Stage” sponsored by The Home Consignment Center, Fans will have the chance to take a selfie with players, coaches, alumni, broadcasters and other Giants VIPs at the Selfie Station on the View Level at Section 302. Please be advised that lines will be long. VIPs will rotate between stations approximately every 50 minutes. Limit one selfie per person, per VIP and waiting for the next group of VIPs is not permitted. The lines must continuously move. The Giants aim to keep fans waiting in line informed of the wait times throughout the day, but it is possible that not all fans in line will receive a selfie. If a guest is unable to stand in line due to mobility, they can visit the selfie station exit to receive an access pass for a designated return time (mirroring the main line wait time). The access pass allows the guest to return to that station’s exit to be integrated into the line. The access pass will be valid for the pass holder and up to 3 guests only. Are you between the ages of 5-12? Click here to enter for your chance to take part in this years KNBR FanFest Kids Press Conference presented by All Cruise Travel on the Alaska Airlines Club Level. It was so much fun last year we added a third session! Take a self guided tour through the Giants Clubhouse. Fans can enter FanFest using one of three Oracle Park entrances : Willie Mays Gate, Lefty O’Doul Gate and 2nd and King Street Gate. The Marina Gate will be used for exit only. Ballpark access will not be available from the Giants Dugout Store or Public House. All gates will open at 10:00 a.m. The following transportation related projects will affect getting to and from Oracle Park for FanFest. As always, fans are encouraged to take public transportation to Oracle Park. Fans taking public transportation should be aware of modifications to Caltrain and Muni’s normal service. All other public transit services will operate on a regular Saturday schedule. Please use trip-planning apps or visit individual operators’ websites for up-to-the-minute information on arrivals. Caltrain: Allow extra time due to the Caltrain Electrification Tunnel Work. Caltrain will have buses waiting at the Bayshore station for each train arrival. Most buses will provide direct service to 4th and King. Caltrain will have ambassadors on hand to help guide people to the correct bus. Muni Metro: The T-Third will be replaced by buses from Embarcadero Station to Sunnydale. The N-Judah will provide normal service along the Embarcadero to Oracle Park. All rail lines will run as normal between Embarcadero Station and westward points, including the entirety of the Market Street and Twin Peaks tunnels. Due to construction activity around Oracle Park, fans are encouraged to park at Pier 30/32. Located on the Embarcadero at Bryant Street (entrance next to Red’s Java House), Pier 30/32 is a 10-minute walk along the waterfront to Oracle Park. Lots open at 8am. Cost is $10, cash only. Lot A and Pier 48 will be open, but capacity will be limited. In addition, lane closures on 3rdStreet could cause increased congestion. Fans coming from the south should exit I-280 North from Cesar Chavez or Mariposa and access Lot A or Pier 48 via Illinois and Terry A. Francois Boulevard. Lots open at 8am. Cost is $10, cash only. Operated by the San Francisco Bicycle Coalition, secure bike parking will be available on the Portwalk near the Dignity Health Center. Concession stands will be open throughout the ballpark serving food and drink (including alcohol). FanFest offers exclusive access to the field and other locations around the park that fans don’t typically get to experience during the regular season. Fans are highly encouraged to take photos with family and friends from inside the Giants Dugout or take a tour of the Giants Clubhouse to see the players’ lockers up close. Fans are encouraged to tour the Giants Press Box and see the field from the media’s perspective. Fans can also visit The Garden, located behind the centerfield wall, to see fruits and vegetables growing in a unique setting. The three World Series Championship Trophies and Rings are located on the Promenade Level, directly behind home plate. 2019 Giants single game tickets and the Ballpark Pass can be purchased at the Box Office on King Street adjacent to Willie Mays Plaza beginning at 8:00 a.m. Tickets will also be sold inside the park, once gates open. FanFest will take place rain or shine. Come prepared! *If a guest is unable to stand in an autograph line due to mobility, they should be directed to the exit of the autograph station. Guest Services staff stationed there will issue an access pass for a designated return time (mirroring the main line wait time) allowing the guest to return to that autograph station’s exit and be integrated into the line to receive an autograph. The pass will be valid for the pass holder and up to 3 additional guests only.